Day 13 and I'm still going strong. Today is going to be a long day painting in South Thomaston. The Kelpie Gallery of South Thomaston is organizing a fundraising event to benefit the Georges River Land Trust called Wet Paint on the 'Weskeag. 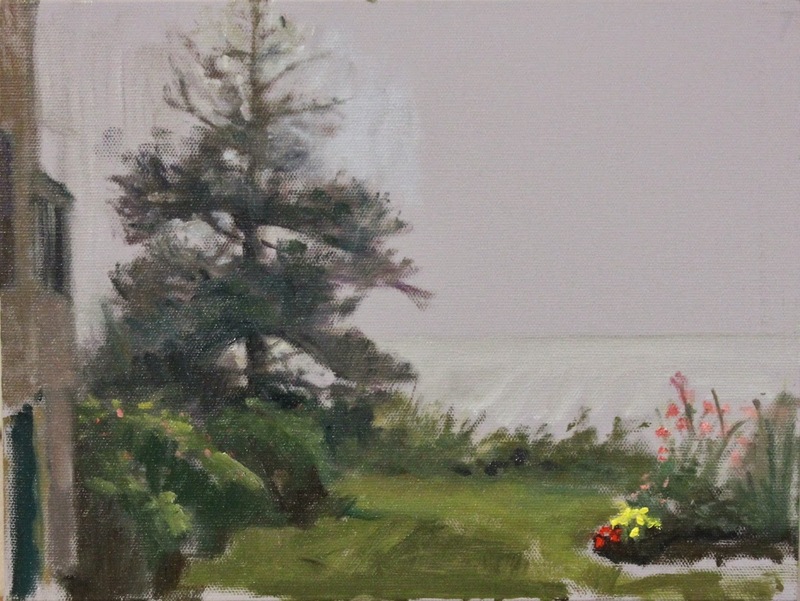 25 local artist were invited for this plein air paint-out and auction. The gala and viewing starts tonight at 5:30 at the gallery. The auction starts at 6:30Pm. We can only do 2 pieces. However, this post was to be about the last painting I did at the OPA paint out in Boothbay last Wednesday. I was facing the ocean and wanted to paint the islands off shore. The fog rolled in so thick, it completely hid the sea the sky and the horizon. The light faded so it was time to quit.